The Proceducate medical app is meant to help physicians not only learn procedures, but to review them quickly before performing them. This is a review of the iPhone medical app, Procedures Hospital Collection. 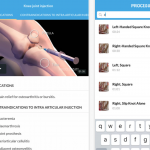 This app uses extensive multimedia to teach you 15 key medical procedures.